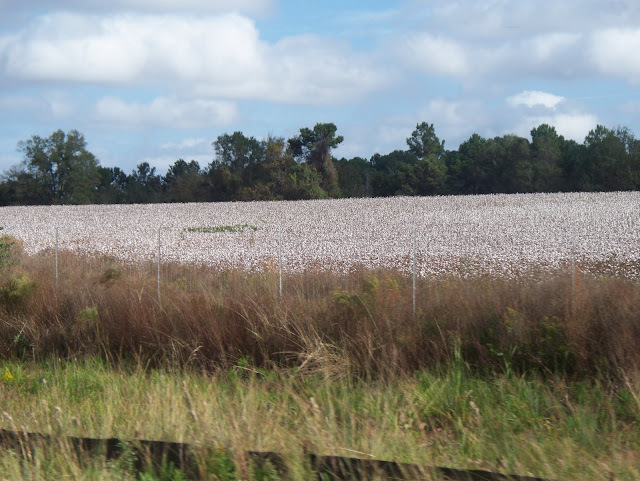 While driving north to Marsel's, we enjoyed the sight of so many cotton fields white with their harvest. We did see a cotton combine at work on one field but I wasn't quick enough with the camera! The bales were huge! 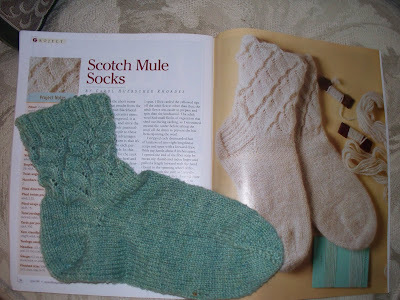 Speaking of modifications.........I am making the socks in the latest SpinOffMagazine but knitting them from the toe up which is my favorite way. The pattern on the leg is reversed but looks good! 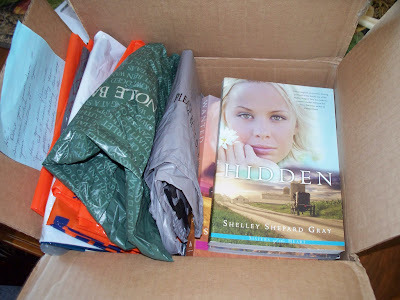 I have started the second one already. I am using the suffolk I spun; it is so light and springy. 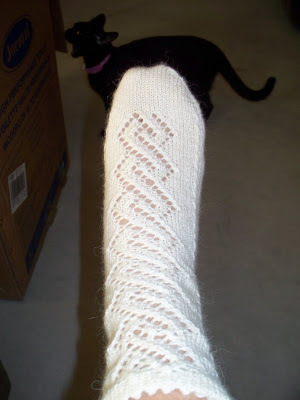 This yarn doesn't full when washed so I have been anxious to knit it up into a pair of socks and see how it wears! 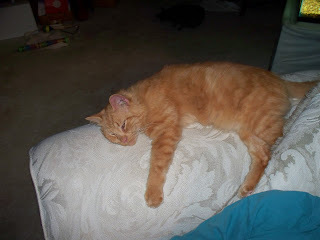 Today, Bill went golfing with a friend, and Marsel and I managed to get in some sewing time. 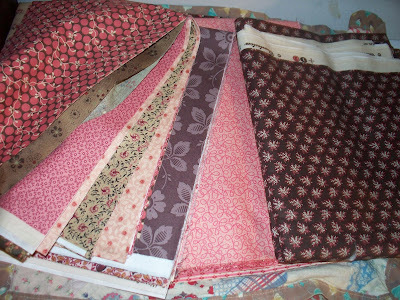 I put together 2 new totes while she is laying down the foundation quilting on a baby quilt. This is the finished product of the dye day. 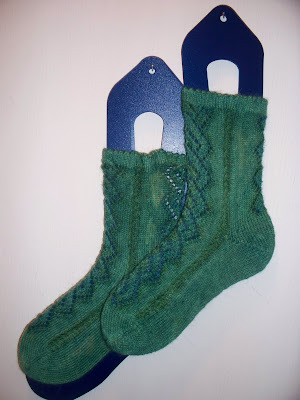 I used dark , color saturated green and blue to highlight the cable and lace area of the socks and then put the leftover blue and green into a bowl and soaked the socks for an hour. This way I got the beauty and unevenness of a dye bath and the accent of color where I wanted it, too. I used the left over dye that the socks didn't take up and used it to dye 2 small skeins of the suffolk yarn for a pair of socks for me-more on that next post! 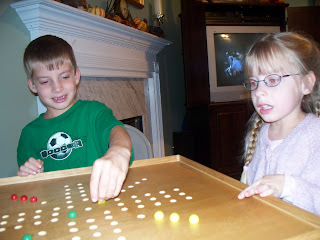 We are going to visit Bruce and Marsel and grandchildren! A whole week to visit, snuggle and converse face to face.............pure joy! 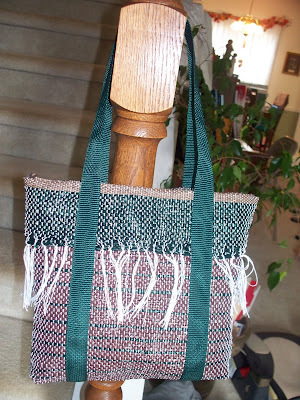 I had the pleasure of weaving four tote bags ; now to tie off the fringe and sew them up. 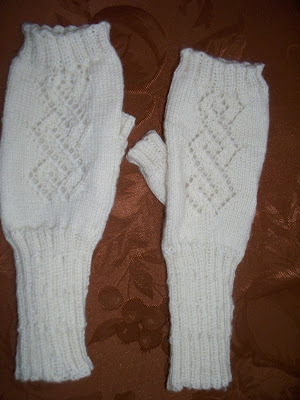 One fingerless glove done using the lace pattern from the socks I completed. 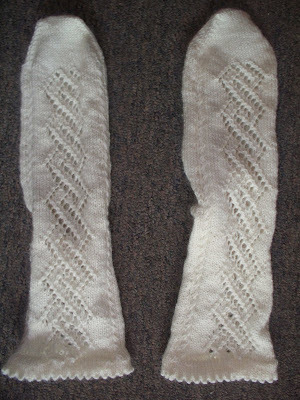 Said socks waiting for their dye bath. I am going to try to put them on a form and then spot dye them instead of using an immersion bath. That is the plan for today anyway! 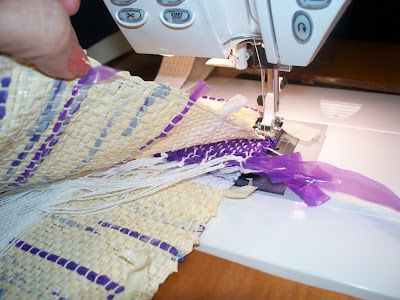 Because it was requested......here is a quick how-to for sewing up the woven plastic bags to make a tote. 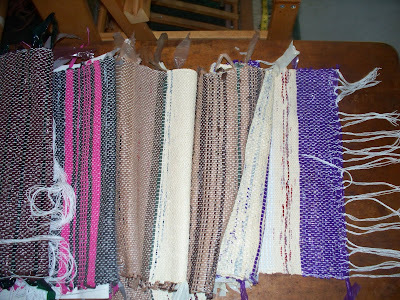 Lay out the woven piece, fold down about 3" on each end for the flaps. I make the straps with 9" above the top of the bag, and 3 1/2" in from the sides. Measure and pin. 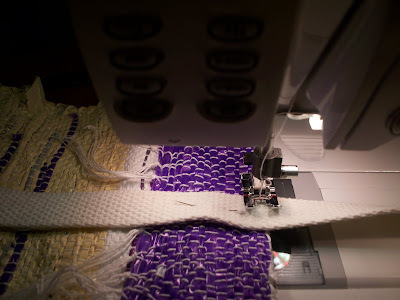 From the table to the sewing machine! 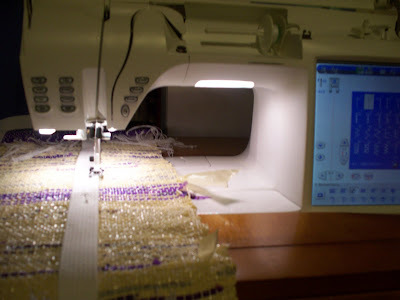 Set your machine for heavy fabric, use a 3.0 straight stitch length and sew the straps to the bag along the edge of the strap. 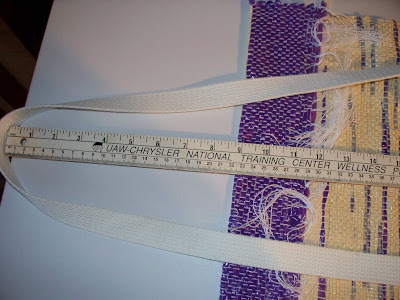 As you near the top, be careful to arrange the fringe, either tuck it behind the strap (on the warp threads you are covering, or to keep the outside ones out of the seam). A little care here will save you trouble later on! 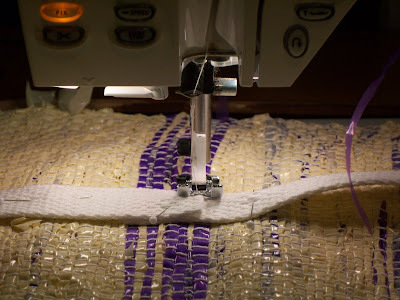 Stop stitching an 1/8" from the top edge, pivot and back stitch to secure the stitching across the top and then continue down the other side of the strap , back to where you began stitching. 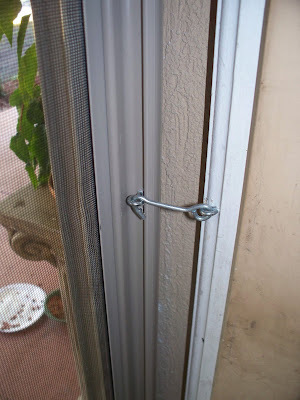 Secure and trim threads. 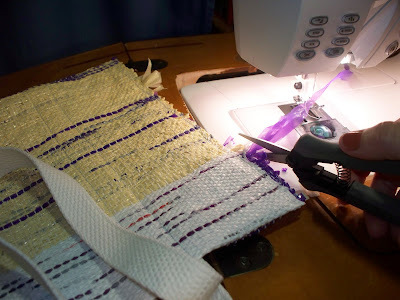 When you come to the join, pivot, change to a multi-step zig zag and cover the end with stitching so it won't ravel, backstich,and continue around the strap with straight stitching, being sure to keep the under layer lined up so it is a neat join. 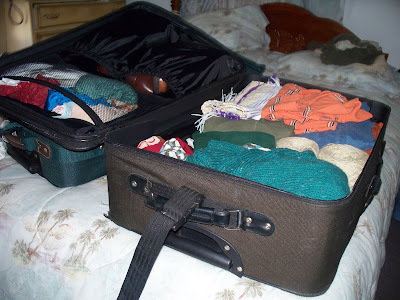 When both straps are secured, fold the bag in half, having the flaps on the inside. Stitch the side seams together with the multi-step zig zag. 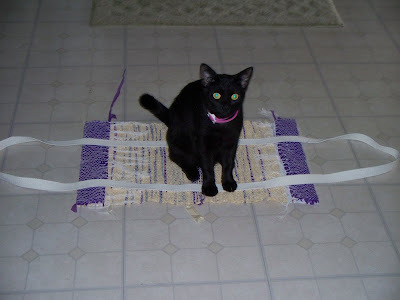 I sew this seam over at least 2 warp threads, and sew it twice for strength. Be sure and tuck those fringe ends in and out of the seam! 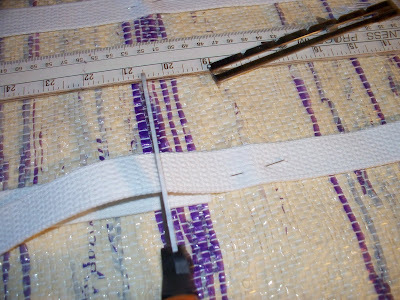 Trim any stray weft plastic to neaten up this edge as it will be revealed on the inside of the tote. 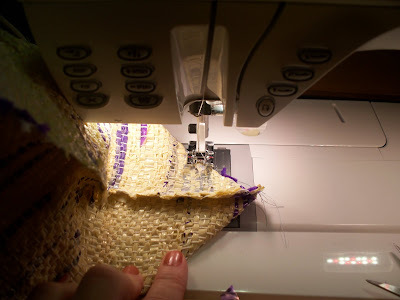 After both sides are sewn, I fold the bag and sew the corners to give dimension to the totes using the multi-step zig zag stitich . (I use the colored part on the sewing throat for my guide :'P which translates to about 1 1/2" in from the point and gives the width of the bottom of the tote 3".) I leave the corners in the bag, they give good form to the corners. 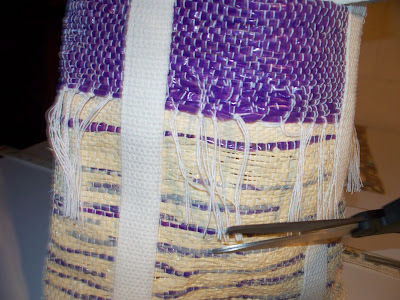 Trim the fringe around the bag to be sure it is level. Remember, cutting fringe is like cutting bangs-better to trim a little at a time than have them too short! You now have a completed bag! 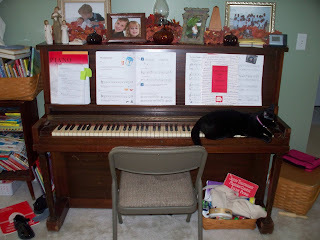 Let me know if I have skipped any pertinent points, or if you have a question! Enjoy. The weather has let go of its heat grip and so we have been using our new screen door most of the day. Nyki learned to open it within minutes so we installed a lock. For the most part she doesn't try to open it any more but does enjoy looking and listening to the outdoors. 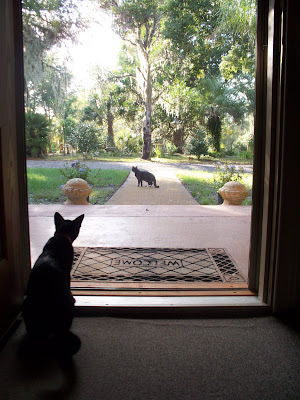 Then the stray came to the front porch and she tried to coax him near.........it didn't work. She even offered her mousie but to no avail. 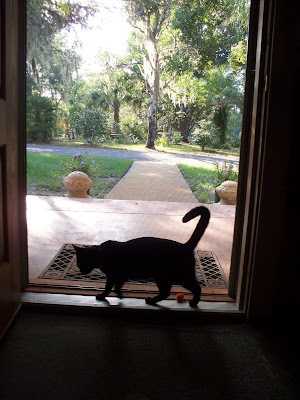 When she began to hurl herself against the door, I went to investigate. Bling has such an instigator streak in him! I had removed the flowers from the stand because of wind, he had an idea........it worked. 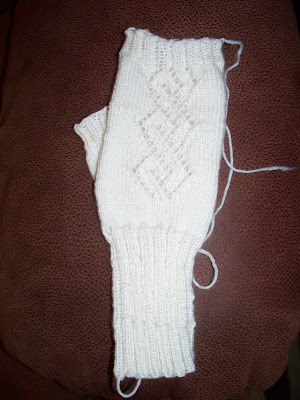 To finish the second sock; I have one sock done and have turned the heel and am cranking out the top. 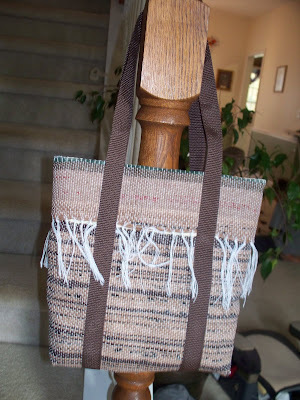 To weave several more tote bags from all the cut-up stash I have been accumulating. I have found that if I keep the balls in this sleeve of a bag, Nyki won't unwind them all over the floor! I have 2 dozen bag balls stuffed in here! 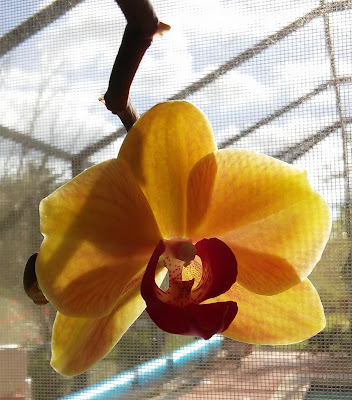 I love a stay at home Monday with all my goals for the week full of possibilities! 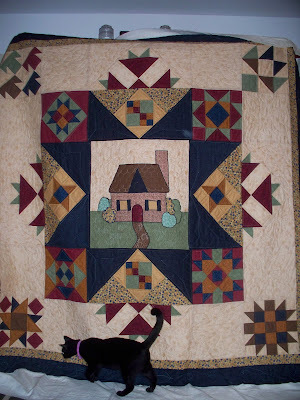 I finally finished the quilt job! 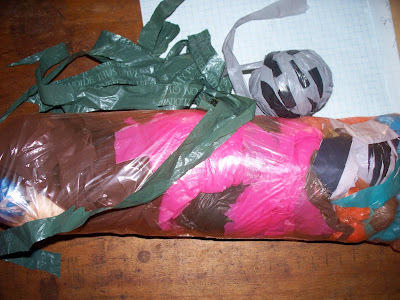 When I came up with a plan it went great-the plan took a long time to come forth is all. I have another one to go on the frame today. 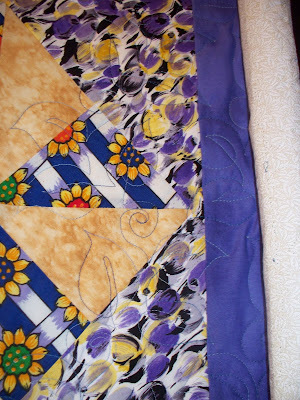 Already have a design for it so it will be a quick quilt. This is a fun experiment. 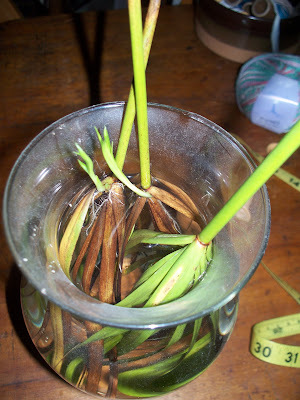 I admired these wispy tall grasses at a friend's so she snipped off the tops and instructed me to put them in a vase of water upside down and just wait for them to grow. I know my face reflected my doubt but I did it just the way she said. Look-I have two out of three that have put out a new plant! It took about a month to see results so I almost gave up-so glad I didn't ! 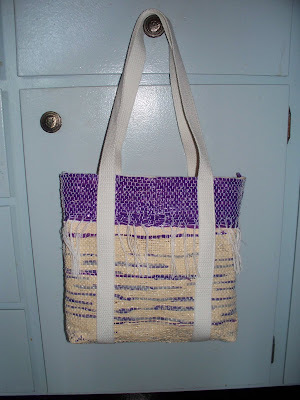 I have the first bag done on the new warp-the purply one! 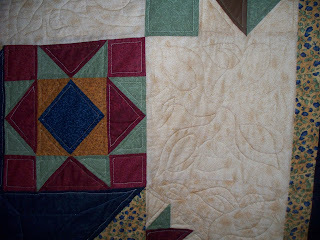 And I am racing to the finish on the quilt.........just have the borders to do on all four sides. 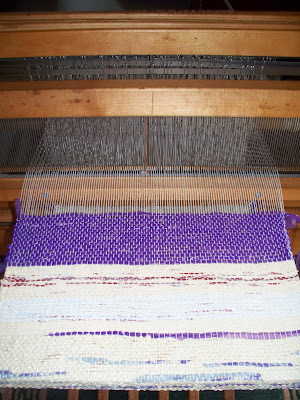 All ready to thread a new warp on the loom; some plastic bags will be used for the weft! We arrrived in Cocoa Beach late this morning and out our balcony we could see a water rescue under way. We never did hear what the rest of the story was......sorry. The humidity and temperature were both high and so these pictures are hazy! The beach was a busy place, windsurfers, beach schooners, waverunners and fisherman. We had a nice walk and enjoyed the sunshine and warm breezes. Nothing like a delicious feast, great friends, shared laughter and perfect weather! 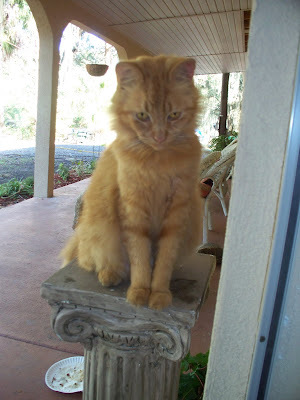 The guys took some of the scraps from our dinner and fed the catfish in Banana River. Here is a view of the results! Crazy! The guys finished off their day fishing; Becki and I went to the beach for girl-time until dark, went to the pool and just lounged; where the men caught up with us and we continued a great evening of conversation. then to a yarn shop and the many local shops in the historic downtown. This is the yarn I bought, cotton boucle. I am not sure what it will be yet. This is a treasure I have been looking for , for quite a while! It is a printers type drawer which I will convert into a shell collection display case! I was so excited to find this! It is rather large, 2' x 3' so it will hold tons! We found some pretty engraved shell napkin rings............just the accent to go with some antique linen napkins I have! I also bought this sea urchin which is not my usual habit, I prefer to find my shells not buy them; but these are pretty fragile so when I saw this green one, well, I couldn't resist the purchase! After our goodbyes, we headed north for home. We saw a sale at a nursery not too far from home and thought we would stop. We bought two of these plumbago plants and will be going back for more; this place was quite the find right in our own neighborhood! Like Dorothy, I am feeling like....'there is no place like home'!